Hazard Mapping System Fire and Smoke Product Current Analysis Credit NOAA. Five people are now known to be dead, two of them children with 17 missing and tens of thousands evacuated as the "Carr Fire" destroys 84,000 acres (34,000 hectares) of land an area three times bigger than the city of San Francisco. The fire is being fed by strong winds and only 5% of the blaze is contained. 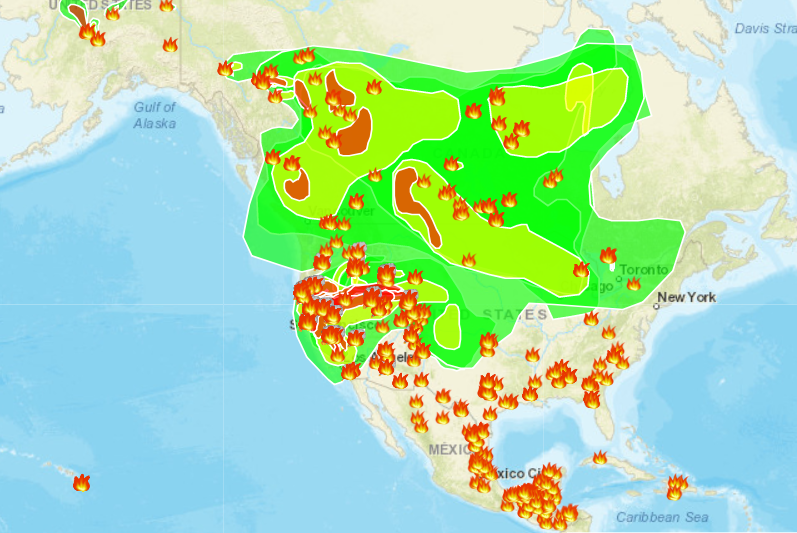 The blaze was one of about a dozen major wildfires burning across California on Saturday and of nearly 90 overall from Texas to Oregon. According to Reuters, the fires which started Thursday driven by gale-force winds exploded into a firestorm that leapt the Sacramento River and engulfed whole neighbourhoods in and around Redding, sending thousands of people fleeing for their lives in a chaotic evacuation. A private bulldozer operator on the fire line and a Redding firefighter were killed in the conflagration. The nearby town of Keswick, with a population of about 450, was reduced to ash. Some 500 structures were destroyed, and 38,000 people remained under evacuation orders as of Saturday, according to the California Department of Forestry and Fire Protection. On Saturday afternoon, Redding police said they were trying to locate 17 people reported missing by relatives or friends since Thursday night. Police Sergeant Todd Cogle said the number of those unaccounted for had fluctuated during the past two days - from as many as 20 to as few as 12 - as some who were reported missing turned up safe and others were added to the list. Counted among them were the three victims whose bodies officials said were found at an incinerated home on the outskirts of Redding.